Last week, at work, I happened to see that the toilet was plugged. I didn't think much of it and, after several attempts, managed to unplug it. There are only two other women in the office but I didn't want to ask them who plugged it so I didn't say anything. Later on, one of them mentioned that the plumber had arrived to unclog the toilet. Um, I already unplugged it. No one told me they had called a plumber. The plumber fussed around in the bathroom for 30 minutes and then presented the bill. $179. The toilet was unclogged but he snaked it and put the camera down it just to be able to charge something, I guess. I'm really glad I didn't have to pay for that. On Saturday, I took my dog, Sassy, to the vet for her Valley Fever test. Her titer finally went down from 1:64 back to 1:32 where it was a year ago. That is good because we were concerned that the medicine wasn't working and she would have to take the more expensive medicine. Now that the VF seems to be under control, I have to decide if I want to try to get her adopted. She was supposed to be a temporary foster but her knee replacement and VF took much longer to stabilize than I expected. I think she would like a family with more people in it. She loves attention and she doesn't get much with me as one of 5 dogs. I think I will try it and see if I can find the perfect family for her. After the vet, my nephew and I went to volunteer at the cat shelter again. He likes the kittens and I prefer the friendly senior cats and "GI" cats (the smelly cats with bowel issues who are in the back room and don't get many visitors). Turns out 30 minutes in advance is not enough time for allergy medicine to block all of the histamine receptors. He had a mild allergy attack but it wasn't as bad as before. Next time he will take a pill at least an hour before. Then we went to dinner at Culvers and I used my gift cards so the total was $1.08 because I wanted cheese curds instead of fries. When we sat down, an employee came over and offered us ice cream sundaes. She couldn't locate the people who ordered them and said she was going to toss them out. I happily accepted them since I had not ordered any ice cream. One I ate and the other I took home and froze for another day. My nephew had ordered a mint brownie sundae and had to go find it because the people working there had left it sitting on the counter. It seems that the person making the sundaes was slow and by the time they brought the ice cream out, the other food had already been delivered to the table and the table number had been retrieved, thus, orphaned ice cream. After that, we went to Home Depot and I bought 6 more bags of bark mulch with the rebate card I got from buying paint last month. $20 for bark leaves $60 on the card for more shopping later. NO MORE SHOPPING until I get the final inspection on my barn-shed (just so that it can exist on my property, not the inside inspection). Really, I have procrastinated long enough. I need to get out there, post my address so the inspector can find it, measure the distance of the turn-off from the main road so I can give good directions, and post the building permit on the outside of the barn-shed so that the inspector can see it. Then call for the inspection. It makes me nervous because the inspector said he couldn't find the address last time and the phone number I left didn't work even though he had supposedly been out there once before for the grading inspection. I just need to do it and stop worrying about it. bless you for visiting the smelly and old cats. they need love too. that dog seems to love the fake grass! I never heard such fascinating stories about ice cream sundaes. Looks like one went in your favor and one against you, perhaps. But you ended up with a freebie which was nice. And the GI cats and the toilet seemed to have similar "issues." Never a dull moment in Daizyland! 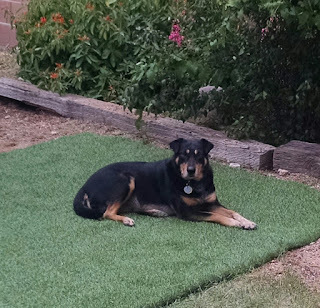 I'm surprised at how much the dogs love the fake grass. I should have bought some sooner. The old ànd smelly cats are in a room in a different building too so many people don't see them. They are so friendly though. I can tell they appreciate the visit. I thought you were going to say "such fascinating stories about toilets" Lol. The ice cream was a nice surprise.